Sarah Jones is well known for her small decorative silver which is held in numerous collections including those of the royal family. 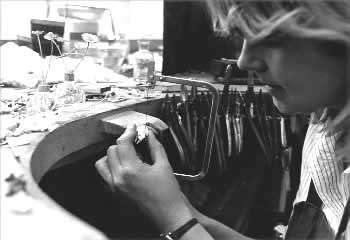 Having sold her work for ten years at Camden Lock market and for twenty years at her London shops in Basinghall Street and Piccadilly Arcade, she continues to make new designs and commissions at her workshop near the City. In addition her collection includes works in bronze. She is a Liveryman of the Worshipful Company of Goldsmiths and a member of the Art Workers Guild. Sarah keeps a small collection in stock but works now mainly on commission. Some pieces shown are in stock, others are only to order. Please telephone or email for prices.